Destiny 2 players can visit Xur the Exotic merchant in the EDZ this weekend. He'll be around until 10am PST / 1pm EST / 6pm BST on Tuesday, April 23. Set down at the Winding Cove landing zone and head north. Xur is on a cliff in the back near a crashed ship. Here's everything Xur is selling this weekend. Xur has outdone himself. This is, bar-none, the best batch of Exotics he's sold in months. Everything available this weekend is a must-have. 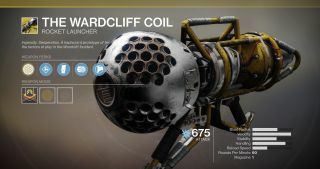 Wardcliff Coil is probably the best arc heavy for boss DPS, Raiden Flux is handily the best Exotic for Arcstrider Hunters, Hallowfire Heart is a powerful and flexible Exotic for Solar Titans, and Lunafaction Boots are key to many boss-melting strategies. If you're missing any of these Exotics, be sure to snag them. And if you do already own them, you can still purchase them again for a shot at a better roll. Don't forget to grab a Fated Engram, too. They can drop Forsaken Exotics now, you know. Here's how to complete all the Destiny 2 Invitations of the Nine AKA Xur bounties.